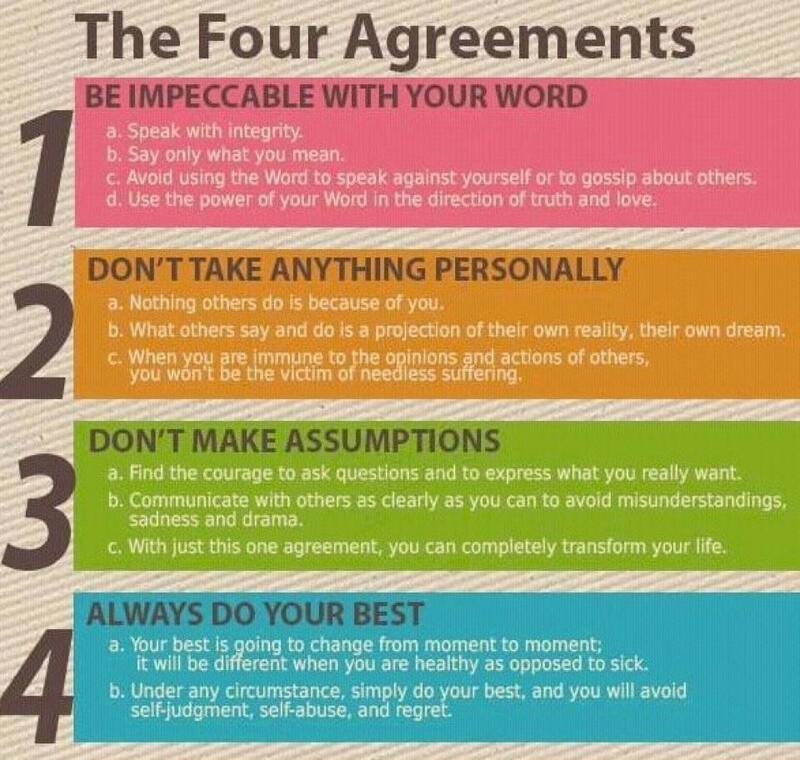 I will attest that since I started adapting these four guidelines in life, I've never felt more empowered and stress-free. I feel more mature and relationships are better. Note that this is personal, worked for me, and your mileage may vary. And it will take time to break old habits and start new ones. It's all about integrity. This sounds very cliche but the people around you need to trust your word. Even you need to trust your own word. And you won't be able to do that if you don't mean what you say. When you make a commitment, stick with it. Don't keep going back on your word. It leads to so much trouble. Just this first pledge alone made my life less frustrating. And I wish other people would take this seriously, too. When you say you will, do it. Tell the truth. Speak with integrity. Avoid gossip. Stop causing problems with your words. Treat your words like it is hard earned cash. They should be spent wisely. Except when you're playing Cards Against Humanity with friends and a little buzzed. You need to lighten up on these times, too. You know what I mean though, right? This also goes both ways. Trust what others say, assume they are also impeccable with their word but hold them accountable to it. This is the part where it started to get weird in the book. It started talking about alternate worlds and people living in different dreams. Uhm, ok.
My takeaway from that is that it's just psychology. People have biases. And what they do is because of what they know was best to do in the current circumstance at that time. They made mental calculations (hopefully) and in their head, it was the thing that they thought of to do first. They do things in their own volition and not because of you. It is because of themselves. Unless, of course, you actually provoked it because you went back on your word. Go back to rule number 1. This is from their own viewpoint in life. Yes, we all need to agree on some things but sometimes, that's just not possible at all. Learn to accept that others don't think they way you do. Accept that people are just different and them acting in opposition of your own creed doesn't mean your creed is wrong. They just have their own beliefs. Once you start realizing that they are just acting in their own reality and POV in life, you will learn to be immune to the opinions and actions of others. You will be free of drama. Cured of toxicity. A lot of conflict is rooted in misunderstanding. I'm sure you agree and I don't have to elaborate why. Always ask if there's something amiss or ambiguous. Or weird. And sometimes, you put yourself down through overthinking your assumptions which may not even be true. Communication is key in any relationship. Friends, lovers, and even work. So step up and ask. Don't be afraid to look dumb. Don't take what they say personally, and do what is needed to communicate clearly to avoid negativity and drama resulting from misunderstanding. If you feel too lazy to confront people to clarify something ambiguous, feel free to have an assumption but make sure to stick with it and deal with the results like an adult. Your best differs depending on circumstance. Do what you can, to your best ability, when you can. Why is this an important covenant? It's because we are people and we are not perfect. We may not be able to do the perfect thing but we can certainly do our best. Much of our mental distress results from regret. Should've, would've, could've. If you didn't do your best at that moment, you will keep regretting it thinking back it could have been better. You could have done better. Get over that. It has been done. Learn from it and do better, do your best next time. And if you believe that was already your best, then that is your word. Have integrity with it. There was nothing else to improve.